"With Apex GTT we selected a high-tech tool that gives us the highest degree of control around the ink transfer. 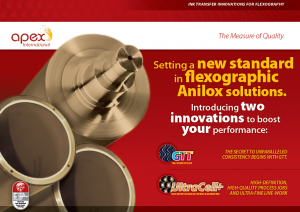 At the same time we were able to reduce our aniloxinventory, thus saving a significant number of set up anilox roll changes across the business on a daily basis." "The most crucial decision criteria for the investment in GTT was GTT’s outstanding consistent ink transfer. Due to this it is possible for us to achieve clear printing results with excellent quality -200lpi jobs are printed with perfect clean dots – job after job. Competing with offset printing is very realistic now."